DIPOLOG CITY, Zamboanga del Norte - After a tiring day of touring around Dipolog City, we went back to Antonio's Pension House to freshen up and get ready for dinner. Cusina de Binoys is located on the roof deck level of Antonio's Pension House. They serve classic Filipino dishes and specializes in set meals for a couple of a group. They also have a live band performing acoustic music every Friday and Saturday night. Browsing through the menu, one dish in the breakfast section caught our eye. Sar-si-log, Montaño Spanish Style Sardines with rice and sunny side up egg. Fortunately, Cusina de Binoys serves all-day breakfast. 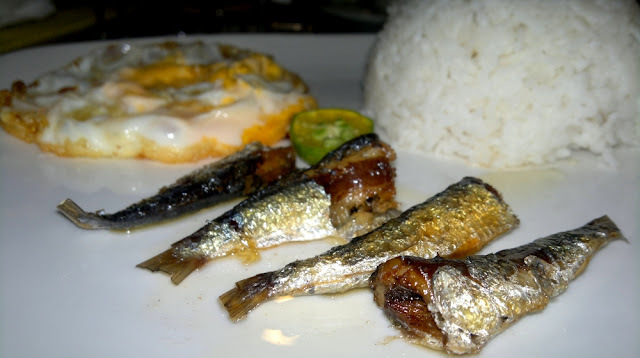 Dipolog's bottled Spanish style sardines is definitely the best. Bottled sardines is a million peso industry in Dipolog City which earned the city its nickname Bottled Sardines Capital of the Philippines.